–quotes from Lestat in Anne Rice’s Queen of the Damned. As some of you know, I’m considering getting a tattoo next week in honor of my brother’s memory. I’ve been thinking about getting one for some time. At first, I wanted to get the Chinese symbol for life. A friend of Scott’s told us that he had planned to get that particular tattoo when he got back home from Iraq the last time. Unfortunately, he didn’t make it back that time. So, that was the tattoo I was going to get. Either the timing wasn’t right, or I didn’t have the extra funds to justify it, or one time both was right and I wasn’t right. I was sick. The answer to the third always varied based on machismo and the body part the tat was applied to. I don’t think that tattoos have the same stigma they had years ago. I remember when tatoos were something only the bad boys had. And if you were a girl with a tatoo, that was completely taboo. Even in my wild teenage years when I wore all black, had big multi-colored hair, ripped jeans, and anything else I could get away with, I NEVER considered a tattoo. Recently, I downloaded StumbleUpon after reading that this site was a great way to increase blog traffic. I am hooked. You select a list of interests, download the toolbar, and when you have free time, or are bored, click on the icon and it shows you websites based on your interests as rated by other members. I, of course, chose books. Which brings me to the quotes I posted earlier. 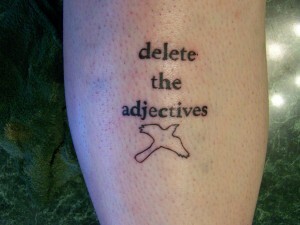 One of the sites I stumbled upon this morning was Literary Tattoos. I was impressed by what people chose. “And the tree was happy.” from Shel Silverstein’s The Giving Tree. 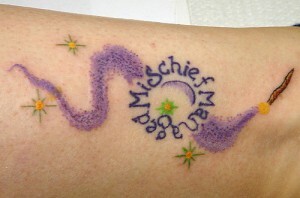 “Mischief Managed” from Harry Potter. 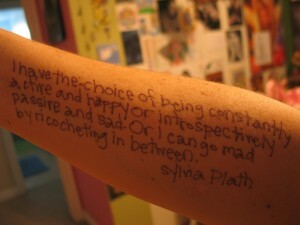 What would I choose if I were to do a literary tattoo? It would be a toss-up between the two quotes I posted in the beginning. The first always stuck with me after Scott died. It always made me think, as long as I never gave up hope, I’d be okay. Changed, but okay. The second, I found when looking for the first one. It’s simple and it’s true. The ones you love are the ones you love. And I am lucky to have the friends and family that this quote describes. ← Do These Shoes Make Me Look Fat? If you don’t know the language and can’t read the writing, then for heaven’s sake don’t get a tattoo in it — unless, of course, you *want* to end up being laughed at on Hanzi Smatter and for the rest of your life by strangers who can actually read the writing. I’m not trying to rain on your parade — just to give you some timely advice. Don’t let the pain be the thing that stops you. I is fairly momentary and oddly addicting and pleasant. Ok, maybe I’m a bit masochistic. Good luck and it really is a personal choice. It is common nowadys people put the tatoo on the body. Unlike those days, only gangsters put on tatoo. 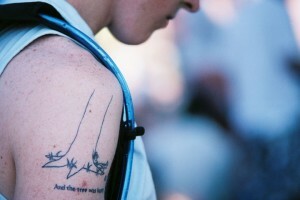 This is the art indeed and creative design make the tatoo looks cool. wow! i love the harry potter one! I have been reading this blog for quite sometime now, and this is my first comment. I would like to tell you that I enjoy reading this blog, and that I love thought provoking articles like this! I discovered your weblog internet site on google and test a few of one’s early posts. Keep on to keep up the very beneficial operate. I just extra up your Rss feed to my Msn Information Reader. Searching for forward to reading far more from you later on! ?